Our grandparents and our parents cleaned the gutters with the season change. So, when we got our first place, we did it too. But have you ever wondered how bad it could actually get if you didn’t make the extra effort? What happens if you just skip the chore this year? The answer is: nothing good. Here’s a short list of potential problems associated with neglecting gutter maintenance. The most common issue is with the gutters themselves cracking under the weight of debris and leaking. Leaks can cause mold and rotting that, in turn, can cause the entire gutter system to fall from the house, a costly effect. The next common issue is that the drains can become so clogged with debris or ice in the winter that snow or water can accumulate on the roof. This can cause serious damage to the roof itself, leading to leaks into living areas or even partial cave-ins. If the gutters are so filled that the water is diverting to the basements or foundations, the basement may fill with water or wooden foundations may rot. This is potentially the most expensive result of unmaintained gutters. If the foundation is not made of wood, water collecting in cracks may expand during the winter, leading to severe mold growth. Where moisture builds up, insects swarm. Carpenter ants, roaches, earwigs, mosquitoes, and even termites can collect in the gutters or in cracks caused by leaking. To avoid issues like these, contact Bell Seamless Gutters today! Functioning downspouts and gutters are the tickets to preventing excess water leakage into the windows, roof, siding, basement and foundation of your home. With heavy rain, fallen leaves, sticks and snow, your gutter and downspout system won’t have the ability to runoff water efficiently. This is why we urge homeowners to take the time to clean gutters and downspouts. Gutters have the job of catching water and keeping it away from the foundation while downspouts channel the water away and into the ground. It is much more difficult to determine clogs in a downspout so you might have to take it off the gutter and inspect with a flashlight. Conducting this type of cleaning shouldn’t take too much time and no more than a garbage bag, gloves and ladder are needed. Cleaning should be done every few weeks and especially after a heavy storm or snowfall. After you’ve cleared the debris you should assess any damage that’s been done to either gutter or downspout. Start by making sure the gutters are properly fastened to the house and that the downspout is secured to the gutter. Also check for cracks, rust or dry rot spots. If you need professional assistance with maintaining, repairing or replacing a gutter system, contact Bell Seamless Gutters today. Around this time of the year, you don’t just have to worry about frozen debris in your gutters; you also have to worry about thieves! The holidays bring out the best and worst in people. It’s no secret that some people are desperate for money in December. One must purchase gifts for everyone. You should keep an eye on your gutters, especially if they’re copper gutters. Copper, as a material, can take a lot of pressure and stress. If you’re in the New Jersey area and need a copper consultation, please give us a call. Copper gutters are longer lasting than your average gutter system. Not only are they durable, they ‘re also aesthetically pleasing and can add to a house’s appeal. Copper gutters, therefore, are expensive and can fetch a pretty penny on shadier markets. Although copper gutters are a sound purchase, please keep in mind the possibility that a thief may have his eyes on them. In New Canaan CT, for example, someone recently stole around $50,000 worth of copper gutters. Christina Commendatore, of the NC Advertiser, reports, “Police said the homeowner noticed part of a gutter on the ground by his garage a week earlier. When he went to repair the gutter, he noticed 10 sections were missing from around the house to the garage.” That’s an enormous amount of money! You can look over the article here. In my opinion, it seems that the perpetrator had been casing the house. This crime could’ve been in plans for weeks or even months! If you have copper gutters, keep an eye for any suspicious activity, such as unfamiliar cars. Copper gutters are certainly a good purchase, for both durability and aesthetic appeal, but copper in any form is popular among thieves. Be leery of gutter thieves! How did worms get in my gutters? How did worms get in my gutters? You may be wondering how worms got in your gutters. At Bell Seamless Gutters, we wonder the same thing. It’s an inconvenience, for sure. You may have even found a bunch of them in your gutters. Like other debris, worms can clog up gutters. They should be dealt with immediately. There should be gutter maintenance and repair. Still, how did worms get up there? Gutter worms are one of life’s lesser-discussed mysteries. They don’t have wings, so they didn’t fly up there. They’re not the brothers and sisters of raindrops, so they didn’t fall from the sky. Did they just magically appear? No, of course not. What’s the answer then? Um, there really isn’t one. Some blame birds and their avian appetites; sparrows, robins, cardinals, finches, and so forth dropping them while in flight. Perhaps these birds were about to eat them and, in their hungered excitement, dropped them. Who hasn’t accidentally dropped food? There’s even speculation that gutter worms are the product of a bird’s bowel movements, after having ate a pregnant worm. The eggs still survive and take a road trip of sorts and with the help of rain, end up in the gutters. You may find this rather…disgusting. If gutters aren’t properly maintained and cleaned, they become hazardous and harmful. Worms are only the tip of the iceberg. With that said, it’s nice to think that even a lowly earthworm can make it to the top, even if it’s because of a goofy bird and its insatiable appetite. In a way, it’s a rags to riches story and at Bell Seamless Gutters, we love those stories! In the last post, I mentioned how the seamless gutter color selection is an added benefit to seamless gutter installation. Make sure not to overlook this benefit to custom seamless gutters, because you take your house’s design seriously, so you have to take the gutters’ effect into account. 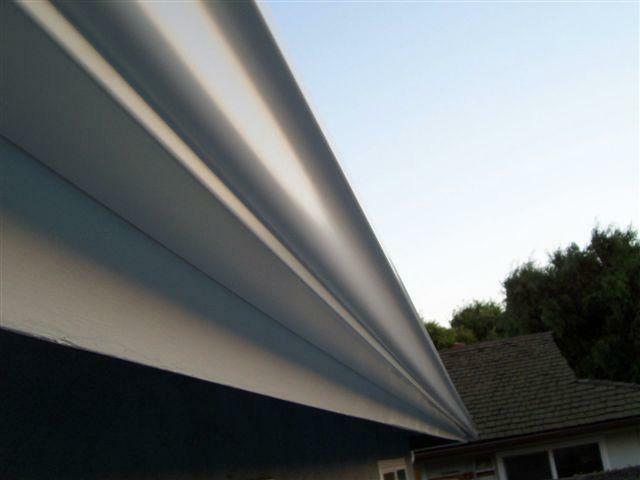 With most other gutter options, you have one color to choose: white. While white is a beautiful and versatile color in many situations, everyone uses it. Plus, not all houses benefit from white gutters. It almost deters you from incorporating other colors into your exterior because, let’s face it, you can only use a limited amount of colors before things start to look ridiculous. With Bell Seamless Gutters, you get to choose from 14 colors, which can match any home design. This way, you’ll have beautiful, custom-crafted gutters that actually work with your home design, instead of forcing your hand in a particular direction. If you plan to repaint your home, you’ll definitely want to consider this as an opportunity to have incredible, functional and custom-installed gutters. Kill two birds with one stone: remove your old gutters, paint your home & replace your gutters with seamless gutters. If you have any questions, make sure to contact us for more information.